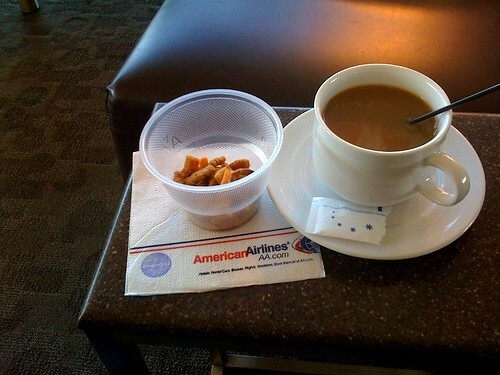 I’ve been thinking about joining the Admirals Club for some time. It’s not that I want or need to be surrounded by luxury (I’ve been to to several AAdmirals Clubs, it’s more like a standard business class hotel lobby than it is a country club), but I travel frequently enough that having access to complimentary wifi, snacks, beverages and an electrical plug makes sense to me, but only at the right price. I’m currently an AAdvantage Platinum member, which allows me to purchase an Admirals Club membership at a reduced price: $400 instead of $500. But, I’m not traveling as much this year as I have in the past, I just cleared enough miles to make Gold status for next year, and with only three months left in the year, I’m not certain that I’ll be able to maintain Platinum status, so I’d like to take the discount while I still can. My status won’t change till February 28, 2011, so I haven’t been in any rush to make a decision, I’ve been waiting for a discount or promotion. While I was reading through some forum threads over at Flyertalk, I came across an AAdvantage miles promotion code, good through the end of this month, that will earn me a 3,000 mile bonus if I sign up by the end of September 2010. Then I came across another post that offered a 20% discount code that’s good through September 28, 2010. So, if I sign up now I’ll get 3,000 bonus miles (worth $112.50) and membership for only $320. I’m averaging about two flights a month, so when I consider that I’m spending $39 per month for a T-Mobil hotspot account (which I seldom use anymore now that Starbuck’s has partnered with AT&T) and I probably spend on average about $10 each trip on coffee and a snack, I think I’ll be saving money. Of course, I’m always holding out for a better deal. 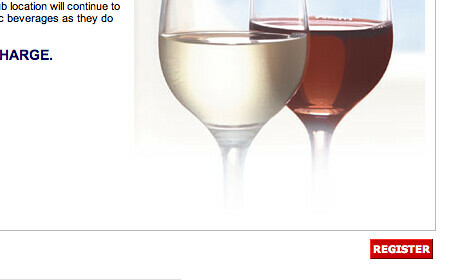 There’s been some speculation in the Flyertalk forums that something Admirals Club related is about to happen. 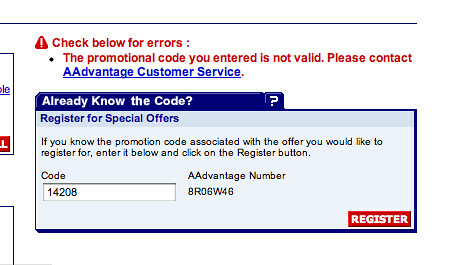 Not just because American recently announced that they’ll be providing free drinks in their domestic lounges, but because this page has appeared on American’s website with a mysterious registration button that tries to submit an invalid promotion code when you click it. i need a AA code for flight reservation…thanks!